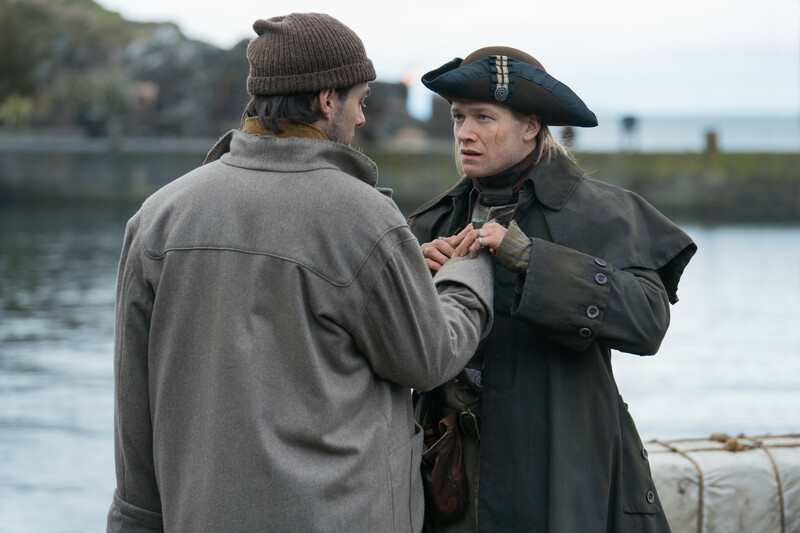 Below are excerpts from new interviews and videos with Maril Davis, Sophie Skelton, and Richard Rankin about Outlander episode 407, “Down the Rabbit Hole.” Be sure to click on the links to read the full interviews. Since these posts/interviews follow the latest episode, beware of spoilers and there may be a discussion about storylines in future episodes. You shared this episode with many actors for the first time [Steve McCree, Nell Hudson] – how was that experience? It was really great. As an actor, I was excited for it because [the audience] has been slowly introduced to Bree. I’ve only shared scenes with Caitriona [Balfe], Richard [Rankin], and a very short one with Tobias, so it was very exciting to work so many who have been in the show since Season 1. It really felt like a proper introduction to the show, into that world. I like how many people we interact with this season. Frank knew that Claire was going to go back in time. That’s what that scene in the study was about, right? Yeah, he learns from that obituary that Claire and Jamie die in a fire. I feel like Frank gets a lot of bad press because he had affairs but I do actually think Frank is getting a bit of justice in that scene. You really see what he’s going through; I think Frank kinda felt used. To know that Claire will go back, it was just heartbreaking for him. I hope that scene gives people a newfound sympathy for Frank. Fans will also see Bree’s relationship with the man who raised her. She was a daddy’s girl and he was very much the one who was there for her. They did have this special bond and she feels such a guilt about going back in time — like she’s betraying Frank. It just adds so many more layers to the story. It’s one of my favorite scenes. “We decided fairly early on that part of the story would involve Frank because in talking about Brianna’s journey and her going back, the fact that she’s never met her birth father and was raised by another man for the first 20 years of her life and that’s the only father she’s ever known . . . how torn she would feel, as a character?” says Davis, adding that Brianna is wrestling with feelings of guilt over her perceived betrayal of the man who raised her. This entry was posted in Interviews, Maril Davis, Richard Rankin, Sophie Skelton and tagged Down the Rabbit Hole, Interviews, Maril Davis, Richard Rankin, Season Four, Sophie Skelton by Sarah Ksiazek. Bookmark the permalink.